Atlas' Hyper 1.5 sits within a larger family of cables, with the 1.5 denoting the cross-sectional area in square millimetres. That's not actually a vast amount of copper by speaker cable standards, but over normal-length runs, resistance doesn't add up to anything too alarming and the materials used are high-quality. The copper is 'oxygen free' (99.9997% pure in this case) and is insulated directly with Teflon and sheathed overall in soft PVC with cotton filler. It's a friendly, flexible cable and is available off-the-reel or terminated in hollow 'O-Z' banana plugs, for an extra £5.10 each. With the terminated set, you even get a cable burn-in CD thrown in. 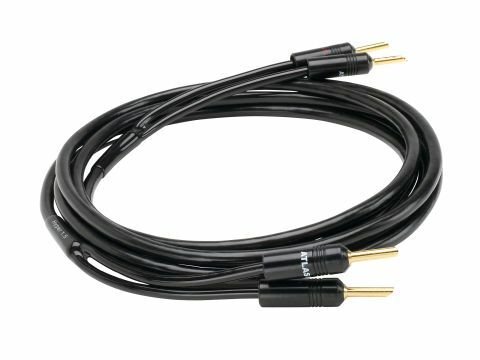 Although this isn't by any means the ultimate speaker cable, it has a significant and appealing strength in its portrayal of detail and tonality in the midrange, and at least most of the treble. The very highest frequencies are a touch dry, as often happens with cheaper cables, and bass is not remarkably extended, though it is certainly clean and free of overhang. Voices and most melody instruments are beautifully clear and precisely defined, with good imaging accuracy too. This means that familiar discs really come alive all over again and one hears new insights in them. It may be that the slight bass leanness is at least responsible: if so, it's a trade-off many will be happy to make.